Here in the US, we celebrate Thanksgiving today! Thanksgiving is one of my favorite holidays, and after this past year of all kinds of interesting adventures, I know I have much to be thankful for! In fact, I’m pretty convinced that every day should be a day of thanksgiving. Without a doubt, I count you high on my list of the things I’m grateful for. You encourage me, inspire me, and help me be a better person all around. Thank you so much for everything you’ve done for me, and for Needle ‘n Thread! We wouldn’t be the community we are without you. I’ll be celebrating the day as I usually do, with my family here in Kansas. We pretty much just hang out, and then, eventually, we eat dinner together. There are some 26 of us in the vicinity, plus extended family and friends, so it ends up being a bustling, busy day of family, fun, laughter …and lots of dirty dishes. This early in the morning, though, it’s quiet and calm, so guess what? I’m going to sneak in a few stitches before the work fun begins! Wherever you are, whether you’re officially celebrating Thanksgiving Day or not, I wish you and yours a happy day full of many good things to be thankful for! A Bit of Holiday Cheer Up and Coming! Between now and Christmas, I’ll be running some very delectable needlework-related give-aways here on Needle ‘n Thread. Keep an eye out for them! The first one’s up tomorrow…and it involves thread! 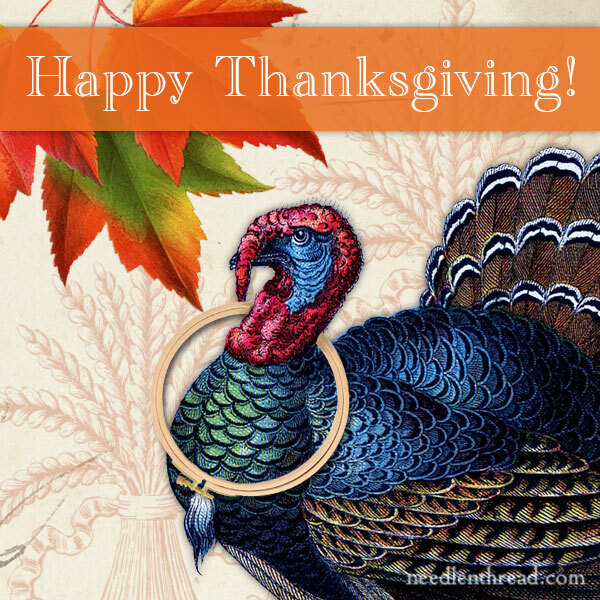 November 26, 2009 The Textile Turkey – Happy Thanksgiving! Happy Thanksgiving. I am celebrating on Saturday. I am going to work on my Stumpwork project today while watching football. I love your website, daily comments and inspiration. Thank you. Hi Mary! We don’t celebrate Thanksgiving in Colombia, but I wish you a happy day and thank you for your great site! I am thankful that I have your wonderful instriuction to turn to when I’m trying to learn something new in needlework. Wishing you and your family a very Happy Thanksgiving. Happy Thanksgiving to you as well, and to everyone else. Thank you for your doses of inspiration! Thank you, Mary. I am thankful for you, and your wonderful blog. I will be doing some stitching before heading out to dinner. Happy Thanksgiving, Mary! I hope you have a wonderful day celebrating with family and friends. I wanted to write and say how thankful I am for You, for all the knowledge you share, for sharing your stitching skills and inspirations, and for all those book reviews that somehow lead to more book acquisitions! Thanks so much! Happy Thanksgiving to you Mary! And thank you for all the beauty you add to life. May you enjoy health and peace and love. Mary, your words always inspire me. Especially on this day when we need to be thankful for what we do have. Love every minute of every post. Have a blessed Thanksgiving with your family. Happy Thanksgiving, Mary! I am very glad too that you have come through this past year so well. All the best! Happy Thanksgiving to you, Mary. You have introduced me to some new techniques, given me a ton of beautiful pictures to view and improved my stitching. Enjoy the day! Thank you on Thanksgiving day you have given us so much over the year/years and I just want to say a grateful thank you to you. I do hope you have a great Thanksgiving celebration with your family and I hope you enjoy every moment and I’m sure the food will be wonderful, it’s making my mouth water to think of the wonderful goodies you will be eating and drinking and the wonderful moments you will be sharing with your family. As you say everyday should be a thanksgiving day. God Bless. Every time I read your blog posts I am reminded how grateful I am for all the hard work and time you put into this site! Have a great Thanksgiving and thank you for everything! Love and Blessings, you have enriched my embroidery with your your generosity. In my dark stressful moments embroidery ahs been my sanity and I have learn’t much. Happy Thanksgiving to you and thank you for your wonderful site. It’s the first one I read everyday, and I’m never disappointed. Even if the projects are way out of my league, I always learn something new and get to enjoy some eye candy at the same time. Thanks again and don’t eat too much….well, um, ok, go ahead… IT’S THANKSGIVING!!!!!! Happy Thanksgiving to you and your family as well, Mary. I’m thankful for your blog. It’s the first email I open in the morning. Even before the Audible Daily Deal. I have learned so much from you And I’m thankful I found you. Mary… I am Thankful for you, this blog, and the many, many hours of stitching pleasure I have had over the years because of your clarity in teaching stitching! Right now, my hubby is preparing the mashed potatoes and veggies which we will take to my Mom’s who lives about 5 minutes away. And at my Mom’s…my brother-in-law has the turkey/stuffing/gravy cooking while my sister has made the cranberry sauce and the pumpkin pie. Somehow, this year the only thing I need to do is open the bottle of wine and keep the glasses full! I am enjoying watching everyone else work on the dinner…and I am not quite sure how I got pushed out of the kitchen…but, um, I am pretty happy about it and I promised everyone that I will take my “keep your glass full of wine” duties very seriously! Happy Thanksgiving to One and All!!!!! Mary, I am so glad I stumbled upon your site. My hand surgery is done and I’ll be soon starting on a crewel piece — just autocorrected to screwed…!– and with your help it will be better than the last one I did…which I still love anyway. Happiest Thanksgiving to you and your family. I’m thankful to have “met” you a few years back, for reasons in addition to stitching. No one chooses to be a role model in adversity, but you carry it out beautifully. You also provide a model for trying to improve my writing. Friends comment that my e-mails have become more entertaining, we have to hope that isn’t simply in contrast to how tedious they were. Happy Thanksgiving to your Kansas gathering! Happy Thanksgiving, Mary. One of the things I am thankful for is you and your amazing website. You’ve got me embroidering again. I don’t have a lot of available time, but it is fun to be picking up a needle again. I give thanks for you and your website, and the wonderful way in which you teach old and new techniques and the videos that show us how to do stitches that leave us perplexed, especially when we cannot et to an embroiderer’s group/guild meeting. I also give thanks for, and to, Noeline who sent me to your website in 2009 when I was having problems with a stitch that no one here knew how to do. Thank you for your wishes for Thanksgiving. Here we celebrated earlier this month. In Québec, it’s celebrated at the beginning of November. But it’s never to late to offer all the best to you first and then all your family. Needlework would not be the same without you. So I wish you all the best. Thank you for your community, your creativity and positive outlook on life. We are so fortunate to have so many things to be thankful for in NZ. And as you say every day we should be giving thanks. Happy Thanksgiving to you, too! I hope that you have a wonderful and happy day with your family and friends. I am very thankful for you, for all of the inspiration and technical help I find on your website, and for the wonderful community of stitchers that you have created. I hope that you have a great day and year. You really are special. Happy Thanksgiving from the UK! Hope you enjoy your day. I hope you have a wonderful day with family and friends. I think every country should celebrate a Thanksgiving Day in some form or another. Our community here is, I am sure, extremely thankful for all you do for us, providing us with your knowledge, and a great site to share it. And a special thanks from me for putting back the ‘previous’ and ‘next’ post buttons. Mom and Carla and I are in the Philippines so we’re off the usual schedule, but wish everyone well! Happy late Thanksgiving to you! Thank you for all the wonderful, inspiring posts throughout the year! Ha! I LOVE the graphic with the turkey wearing an embroidery hoop around his neck! 🙂 I’m so glad you like it, Colleen! I had fun making that. At first it was just a background with pretty leaves. And then I thought….why not add a turkey and brighten things up? And then, once he was there, I couldn’t resist the embroidery hoop! Gracias a ti por tanto conocimiento que nos compartes! Lamento que en tu nueva página no tenga la opción de traducir….cuesta más para quienes no dominamos al 100% el inglés! Salud y felicidad para ti! Previous Previous post: The A-Z Series: Another Great Series for your Bookshelf! Next Next post: A Stitcher’s Christmas Give-Away #1: Thread!